Stare Down with a Squirrel? Steven (Chicagoland, United States) on 7 March 2014 in Animal & Insect and Portfolio. While appearing deadlocked in a stare down contest, this squirrel was actually reacting to the sound of my shutter on my camera. Photo captured March 1, 2014. Watch out. I think he is nuts. Or has nuts. Don't mention the word 'rodent' to him . . can get nasty. Wow...what a gorgeous portrait ! A great close up of this squirrel's face. They are always on the lookout for another morsel to eat. Adore! the little paws clasped together are so sweet! Such a cute and fun shot. :) Lovely.... Such a sweet creature. Amazing closeup portrait. Nice exposure in a snow scene and use of selective focus. such beautiful pose, focus, details, colors & lighting! This is the best one yet. "Full on looking you in the eye, portrait!" 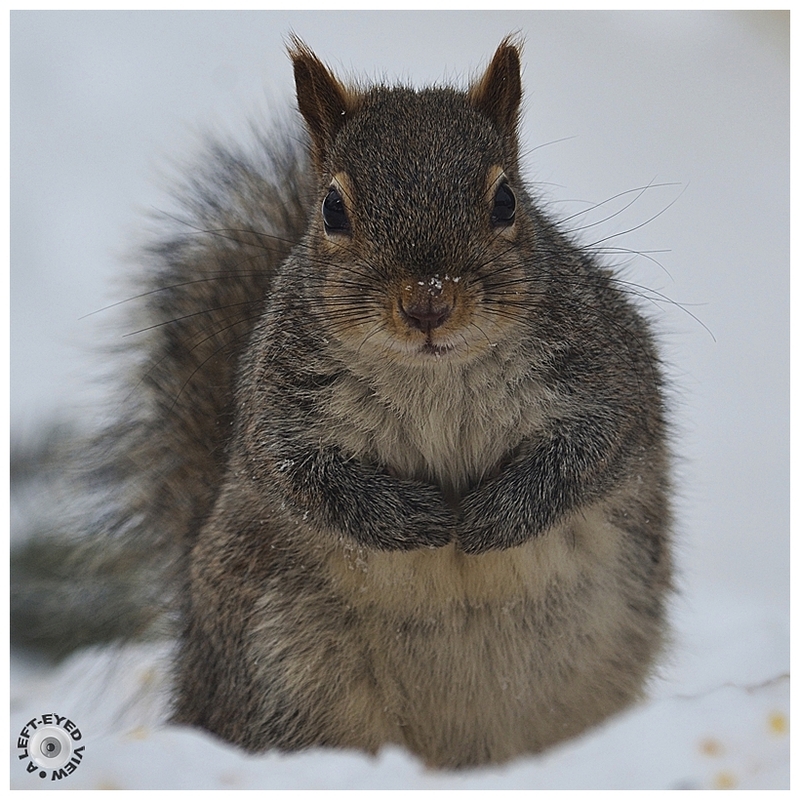 Cute capture ... even his pose is adorable and looks to be eating well this winter! Fine furry critter. Amazing you could get so close. Wow Steven, this is spectacular and totally adorable. A wonderful portrait of this little fellow! The Washington Post is having a squirrel photo contest. You should enter this one! 5*s! All your images are so sharp and good details, Well done. Waow! What a gorgeous portrait, so cute! Wonderful details! Hey, it's cold out here ... can you spare a nut or two?